When I turned 16 and could legally get a job, I was hired by a local “mom & pop” drugstore. Drudgery. Hated the work. Then I had a brainstorm: why not apply at the Civic Theatre for an usher's job? I did, and was hired! Hey. now I was in Show Business! The manager at that time (1954) was Eline Bright, formerly Eline Bowers. A lovely lady, but she could be “hard as nails” if the situation called for toughness. Since I was in high school, most of my hours as an usher were on weekends, which meant working the Saturday matinees for kids. Oh, the mess they made! I remember we used to use wide snow shovels to shovel up the empty popcorn boxes, candy wrappers, etc. , and then bag this trash. One thing I did on a weekly or semiweekly basis (depending on whether the movies changed mid-week) was change the marquee. There was a tall ladder and I had to change all three lines of the marquee, both sides, for $1. 00. And I loved it! I remember that when Gone with the Wind was playing, I suggested to Ms. Bright that we use the top line of the marquee to state: THE GREATEST MOVIE EVER MADE! She was unsure we should do that (false advertising?) but I showed her a clipping from the newspaper that called GWTW the greatest movie ever made, so she allowed me to do that marquee that way. (Of course, I had at that time read GWTW at least 3 times, and had fallen in love with Scarlett O'Hara. ) 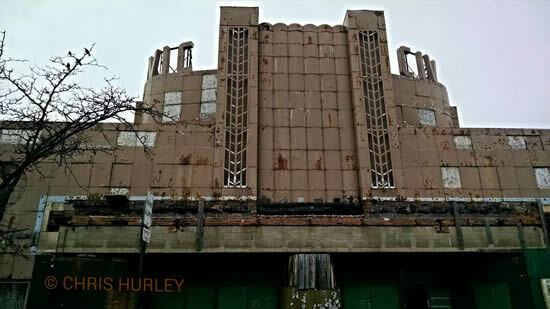 When I graduated from Denby High School in 1956, I missed the Civic and Ms. Bright. 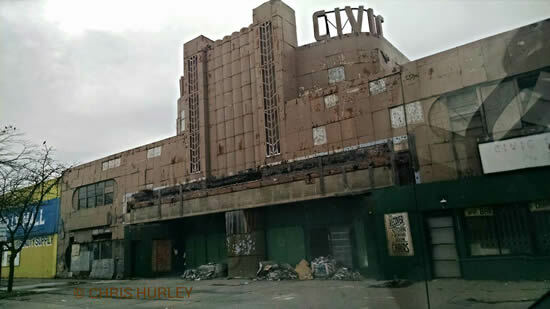 Now, seeing what has happened to this magnificent theatre, I feel sad. My Uncle, Joe Miskinis, owned the Civic when I was very young. My parents owned the Concession Stand. 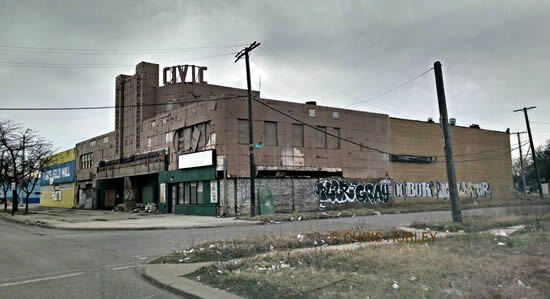 I used to pack bags of candy in our basement in Detroit to bring to the Civic to sell the next day. Then, my Dad and I would go to his Popcorn House in Dearborn, and make popcorn to sell at the Civic. Dad designed the popcorn machine. I would turn the big cans of popcorn until they were full, pack them in Dad's van, and off to the Civic we would go. At other times, I would bring friends from the neighborhood to see a free movie on Saturday with me. Made me popular in the neighborhood, for sure. I loved the GRAND staircase and elegant restrooms. You only see elaborate architecture like that now at the Fischer, etc. I was so blessed to experience this in my childhood, and I learned the value of hard work. What a sad state of affairs-A COMPLETE SHAMBLES The whole neighborhood should be leveled It makes me cry to see what has happened to a once beautiful place to live. TIME MARCHES ON-seen DENBY lately?. 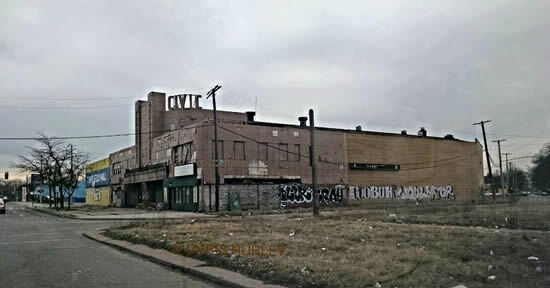 I worked at the Civic Theater from December, 1983 to July, 1984. Good times. I was the assistant manager when I was 18, about around 1979. I worked there as my first job started 1977 to about 1980. Joe Trinker was the manager. He was a tough guy on the out side but a real softy. We use to pop our own pop corn upstairs. I remember there was 3 hugh boxes of old movie posters behind the screen filled to the top. They were back there since I worked there. Joe had a guy come in to paint and asked me to clean the back out. So I did! The painter asked what I was going to do with the posters I said ( hold on to your hats) throw them out. So I gave them to him. I had no idea what they were worth. Posters like gone with the wind, lady sings the blues well you can only guess how old and how many. Well Joe was not a softy that day! he was going to kill me! 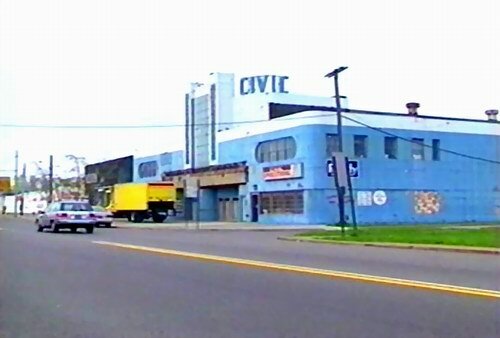 Civic was the last of the largest single screen in Detroit. After I left they split it into 2 theaters. I work in Detroit and pass it every day. What wonderful memories of the civic!. Mrs. Bowers was the manager at the Civic who used to give us the extra. 02 cents. She was the blonde lady. I was the Head Usher there during the summer of 1966 after my Junior year at Notre Dame High School. I worked 48 hours a week at 50 cents an hour. Take home pay was about $19. 00 or so. I worked there with my good buddy Freddy M.
and others. We had a great time as many of our buddies in the neighborhood, i. e. Bob, Ray, Al, Bill, Eddie, Tommy, etc. would attend the Saturday afternoon matinees, and in general cause some good natured trouble, e. g. like turning the fire hose on some unsuspecting girls, dumping popcorn tubs of water on each other from the lobby balcony, spreading Sanders Chocolate Bumpy Cake on the seats of ladies who complained to us ushers that it was too noisy. The price of admission was 25 cents, and a box of plain popcorn was 10 cents, and buttered popcorn was 25 cents. Of course, ushers dined free. To correct some earlier entries, the lady who managed the Civic Theatre was a Mrs. BRIGHT. I think a family called Miskinis owned it, and Mr.
Miskinis'' two daughters would show up to help once in a while. And yes, Mr. Beck was the projectionist and a really nice guy. It was surreal to sit upstairs in the projectionist room with him hearing the reels whine, and to hear his explanation as to how the two projector tandem was coordinated. That was an eventful summer, and the show as we called it became a hangout for many of us. Close by favorites were Fred''s Lunch, Sanders, Kresge''s (the Dime Store), Cunningham''s, and of course Bono''s Pizzeria. I took accordion lessons upstairs at Mike Morreale''s music studio. He too was a great guy. 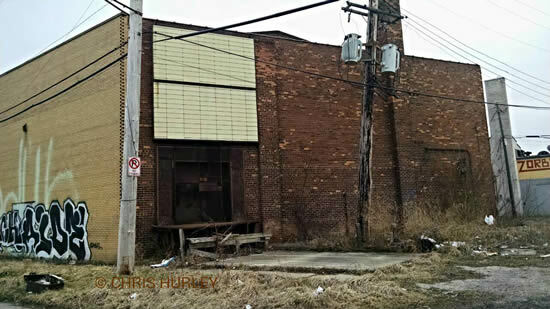 That area of the East Side of Detroit was a great place to be a teen. On Satuday nights after the movie, we would cruise and hang out at Blazo''s in Grosse Pointe Woods, or Big Boy''s Drive-In or Burkemos at 9 Mile and Jefferson in St. Clair Shores. We just caught the tail end of the American Graffiti - Happy Days era. My Uncle Joe Beck (actually my great uncle) was the long-time projectionist at the theater. He was a kind, friendly guy who liked the kids. I would often leave the theater to get him a coffee at Sanders or Cunninghams. He''d tip me a dime or so and I would spend it on candy or popcorn. The manager, Mrs.
Bowers, was one tough cookie. I saw her burst into the men''s room when teen boys were in there smoking. She didn''t care how big they were! She''d get in their face and there was never any remarks except Yes m''am, and Sorry m''am. Tickets were about a quarter in the 50''s. Quite a bargain for a double feature, previews, cartoons, and perhaps even a serial! 4 and a half hours of babysitting for only $. 25. The Vogue and Harper theaters were also in the neighborhood. I believe that the Harper would get the new movies one week before the Civic. Of course all the BIG movies opened downtown at the Fox, Madison, Michigan, Grand Circus etc. The Civic show was my home away from home in my youth. Having attended Guardian Angels School the Civic was our place to go when our parents grew tired of us. We moved in the neighborhood in 1943 and most of my Wednesdays and Saturdays were spent at the Matinees. I remember one occasion when the management decided to let everyone in free. The line was in the empty field where Grinells was eventually built. Movie was Frankenstein and I sat in the aisle because of the crowd. The blonde lady someone else was referring to was Mrs. Bowers. She used to patrol the theatre with her flashlight and end any amorous encounters when we were teenagers. The store to the right of the theatre was originally the Civic Cleaners. I must be older than you all. Sat. admission in the fifties was $. 07. We didn''t have any extra money so when the price unexpectedly raised to $. 09 one Saturday, none of us had enough to get in. The manager, a blonde lady, gave everyone who was short the $. 02 difference. Very fond memories of the Civic and the neighborhood. Enjoyed walking the few blocks up Alma to take in a Saturday matinee (did it many times). In those days you could walk alone and not worry about being snatched-up or worse. ''Rock Around The Clock'' w/Bill Haley and the Comets was my fave'' as a youngster,but ''War of the Worlds'' made the walk home seem to take an eternity. Bathrooms up the stairs-Ladies left-mens room (w/smoking area) to the right. For $. 25 you could see two movies. Sometimes the Previews were the best part of the show. My dentist had an office upsairs next to the Civic above the music store. I also remember the Duncan YO-YO contests held out- behind the dimestore. Milroy''s fish''n''chips were always a treat. Then came the fiutre!. My cousin lived on Duchess St, south of 7 Mile Rd, and every time I visited him ,from Grosse Pointe Park, we would usually go and take in a show at the Civic Theater. One such visit I recall involved a Wednesday summer matinee that showed a Lash LaRue western. We coaxed our grandfather to take us, and he did. We also went alone. many times. It was a different era back then, now, sadly, gone forever. I PRACTICALLY LIVED AT THE CIVIC THEATER ON SATURDAYS. WE WOULD ALL HAVE $. 75 EACH,. 35 ADMISSION AND THEN A POPCORN AND A CHERRY SODA OUT OF THE ONE OF TWO VENDING MACHINES, THE OTHER ONE WAS AN ICE CREAM VENDOR WITH THE BEST ICE CREAM SANDWICHES. THE LADIES RESTROOM WAS ON THE LEFT UPSTAIRS AND DECORATED IN PINK AND BLACK (VELVET LIKE) WALLPAPER. WE LOVED THIS THEATER! THERE WAS GRINNELL BROTHERS PIANOS ON THE CORNER AND CINDYS CARD SHOP. A SHEET MUSIC STORE NAME MOREALLE MUSIC WAS DIRECTLY NEXT DOOR. I RAN INTO HIS DAUGHTER A YEAR AGO AND HE IS STILL ALIVE. DOES ANYONE REMEMBER LOUIE BROOKS WHO WORKED THERE IN THE LATE 50S?. I managed the Civic and the Alger in the early 80s when it was owned by the Stieners. 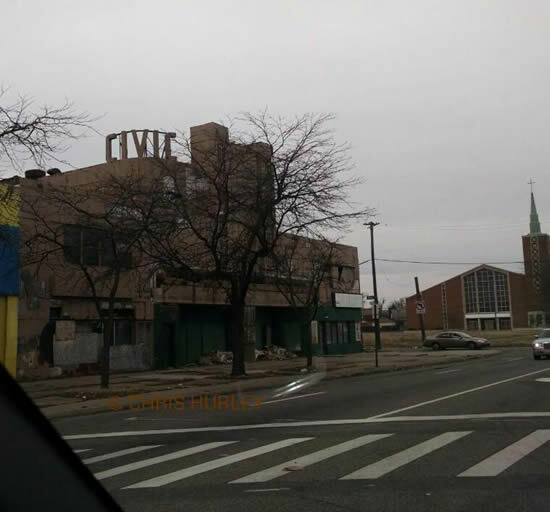 I also hung out at the Civic as a child. What a great little shopping area. I remember there was a Winkelmans, a Kresgees, a shoe repair, a music store, and a Sanders. The cool thing about the Civic is the underground tunnels and fall out shelter below the theater. The building is not owned by Guardian Angel Parish. It is owned by my father Sam Solomon, and has been since the theater closed. 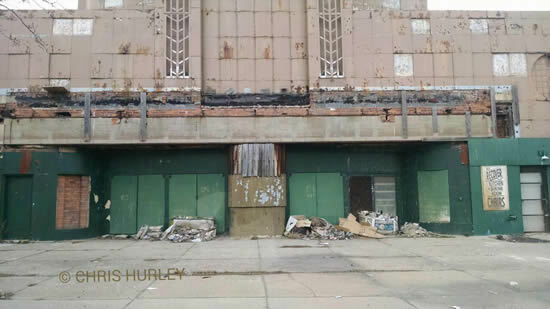 I am looking for a picture of the theater from back in the 40s if anyone could help. The restrooms and the projection room were accessible be two stairways connected by a balcony. The projectionist would usually allow kids into the projection room where he would demonstrate how the film was loaded and other techincal tasks. We even got to view the movie from his window for a few minutes. One of my favorite recollections of the Civic was seeing a Hard Days Night (35 cents) on a Saturday afternoon in 1964. The place was loud without an empty seat!. I worked at the Civic in 1973 as a candy girl, for the whopping salary of $. 85 an hour! Mr. Trinkler was the manager then; he also owned the Ford drive-ins out in Dearborn at the time and lived at Ford Road and Inkster in Dearborn Heights. I believe the building is now owned by Guardian Angels Parish (the church is located next door). 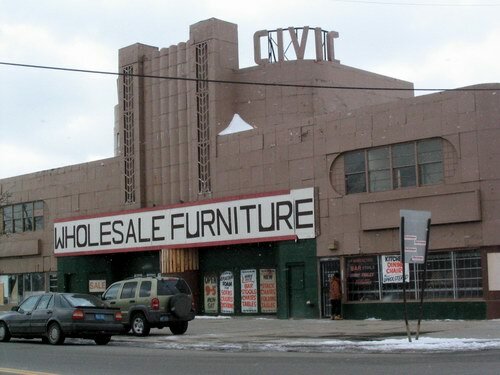 Opened in 1941, the Civic Detroit was an Art Moderne style first-run house, which could seat around 1455. It was also known at various times as the Detroit Civic. In 1980, it was acquired by Eric and Ervin Steiner, who triplexed the auditorium in 1981. It closed in 1984, and was subsequently used as a furniture warehouse, though it retains some of its original decoration. Cinema Treasures Link.